Did you have a gala day May 1? I forgot to post this excerpt from my 1937 Compton’s Pictured Encyclopedia on May 1. According to them, May Day, as it’s traditionally called, has always been a gala day. May Day and the Maypole dances that go along with it have come and gone out of style throughout the years. It began back in Roman times as a festival for Flora, the goddess of flowers, but may have come from India even before then. 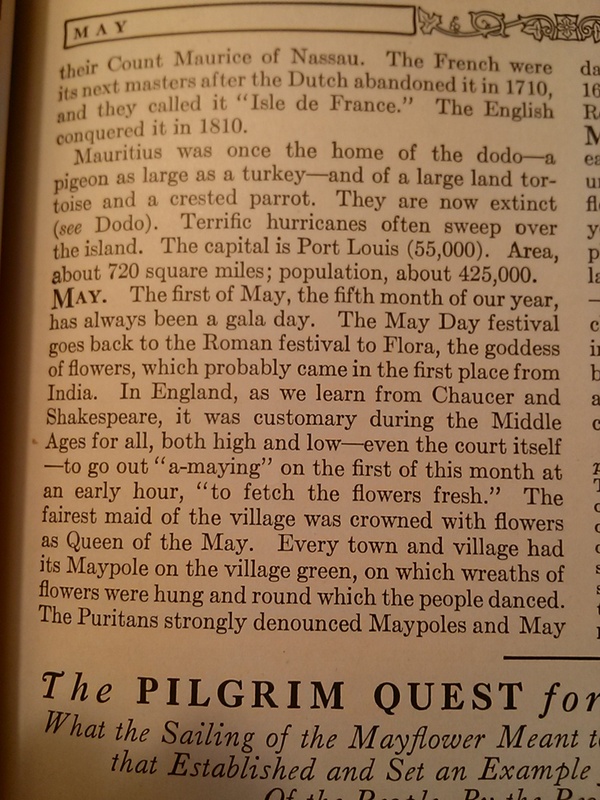 Chaucer and Shakespeare have a lot to say about England’s court going “a-maying” and every village square had its own Maypole which was hung with flower wreaths and then danced around. That is until the Puritans put a stop to it. Hmm, funny, then, that one of the pilgrim ships was named the Mayflower. This entry was posted in Comptons Pictured Encyclopedia 1937 by dborys. Bookmark the permalink.